So, I’ve been following this whole Late Night TV drama for the past several months…..even caught a peek at Oprah’s Jay Leno interview yesterday…and I’m just amazed at the general public’s reaction. Someone once said, “Never underestimate the American public”, but they’ve surprised me more than ever. I guess the only way you’d be able to understand the whole thing is if you were ever under a contract. When you sign that contract, you lose part of that, “I’m tired of all this, I’m leaving” freedom you have with most jobs. Oh, sure, you CAN leave…but then start dishing out thousands of dollars to attorneys if the company wants to cause trouble. The real issue here is NBC. Five years ago, they came to Jay and said that they didn’t want to lose Conan to another network, so to keep him around, they wanted to offer him “The Tonight Show” to sign a long-term contract. Jay was told he was going to give up the show, whether he wanted to or not. If I put myself into his spot, I would have been thinking, “I can retire or hop to another network if I want to keep working”. Well, the time came for the transition and NBC realized that Jay had more life in him, but they had promised the show to Conan. Jay had 8 months left in his contract, so he couldn’t leave. There’s that pesky contract thing again. So, Conan took over the Tonight show and to get some use out of Jay and save millions in production costs, they tried “The Jay Leno Show” in the 10pm slot. Why? The network was saving millions of dollars every night by doing a live show, instead of a produced drama. For those who haven’t noticed, they did this with the 8pm hour two years ago. All reality-based TV shows or game shows that don’t cost as much to produce. Bottom line: they got greedy. When the 10pm talk show idea backfired(and I truly believe, in the long run, it would have worked) AND Conan in the 11:30 time slot also backfired, NBC had to do something. But it was the price they paid for wanting to have it all. How this could have been prevented was to make a decision, rather than put it off. Conan has talent, appeals to a younger demo and has occasional moments, but in the spirit of “Saturday Night Live”, there’s a lot of non-funny in there. Jay HAD to try and make something work. At least for another 8 months. From the network’s point of view, they finally had to make a choice…and they chose Jay. However, in the process, they seriously damaged that relationship and it wouldn’t surprise me if Jay also bolted somewhere down the line. But both were under contract and when you’re under a contract, options are limited. You don’t try to be “a bully”, you just try to survive until things get better. If the network does screw you over, you at least walk away with $32-million in your checking account. Tim, you have captured much of what’s been going through my mind about this. As someone who remembers Steve Allen, Jack Parr, Carson and Leno…and who enjoyed Conan in the late, late night…this is abysmal. First, why didn’t they make the new Leno show a clone of what made him so popular on the Tonight Show? Instead, we got crappy TV. And as much as I like Conan, he was bombing on the Tonight Show. 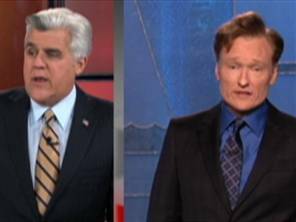 Why didn’t NBC just admit that Leno owned the 11:30p time slot and keep Conan where he was? He wants to go to another network? Offer him more money, a spot on Leno’s show, etc. In the end, they lose Conan and Leno is tainted. Feel most sorry for Leno. He was king of late night, as was Carson. He ends up looking like a bad guy. Not fair.